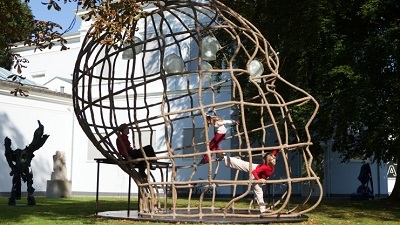 Greenwich+Docklands International Festival (GDIF) is London’s leading festival of free outdoor performing arts (theatre, dance, and street arts). 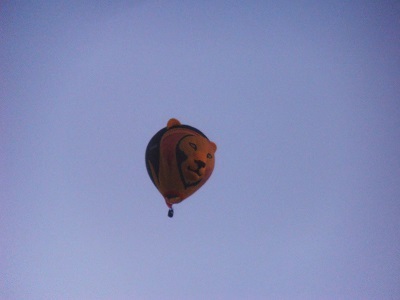 In 2015, the Festival featured over a hundred performances by dozens of national and international companies with more than 100,000 people attending the outdoor shows in East and South London. 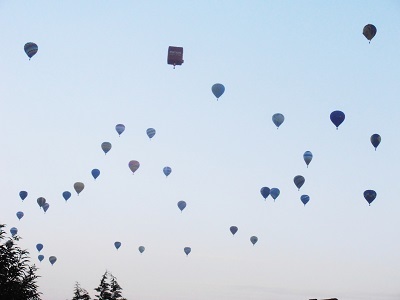 Although there are plenty of performances based in Greenwich and other locations, the focus in Canary Wharf is Dancing City which takes place on the 1st and 2nd July. Dancing City is the UK’s largest annual outdoor programme of free outdoor dance with performances from UK and international dance companies. 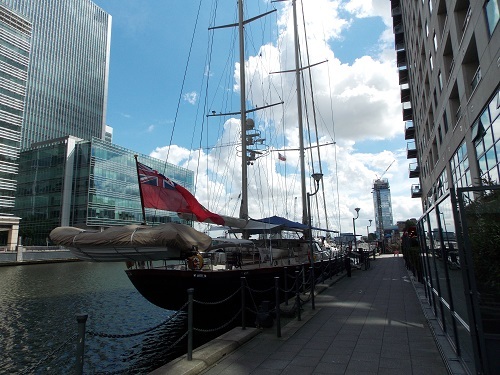 The locations for the performances are the parks, piazzas and waterfronts of Canary Wharf. To give some idea of what performances are planned, here us a quick checklist. Neuroscience combines with art as dancers perform in, within and around a giant sculptural head created by artist Pieter van de Pol at Dancing City. Two nomads meet and form an immediate bond. Their bodies sync as they react and respond to their new found situation in this Dancing City sensation. 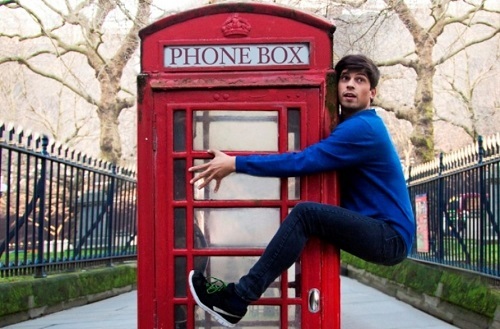 The red telephone box is a British icon but with this performance from Corey Baker Dance you’ll see it in a whole new light at Dancing City. Choreographed by the trailblazing Arlene Phillips, this London premiere at Dancing City plays with and disrupts the traditional love duet. In a world where communication is so often via a screen this show reminds us of the simplicity and warmth of human contact. HURyCAN returns to GDIF at Dancing City with a new production explores life as an organism. Hip Hop theatre meets the beautiful game in this high energy dance piece, including fast-paced footwork and physical floor work. An atmospheric, adrenaline-fueled performance exploring ideas of identity and territorial impulses as dancers soar and swoop through the air. 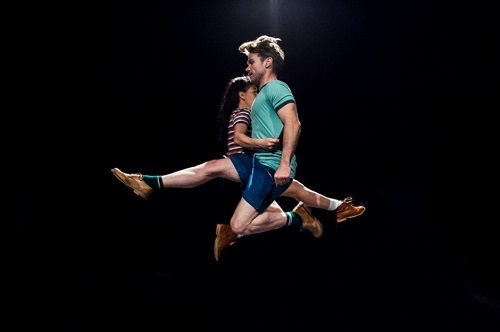 Stuck with each other and stuck in a rut, folk dance misfits, Up & Over It take a whimsical look at the ups and downs of sticking together at Dancing City. 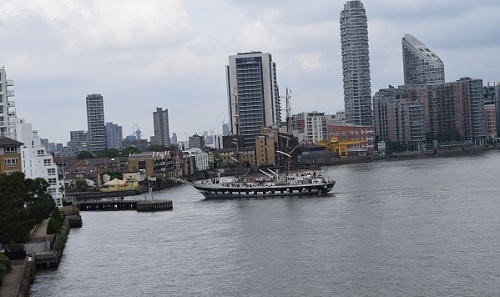 At the end of April, I reported on the launch of the The Isle of Dogs Living Archive which is a community group set up to explore and celebrate the visual and oral history of The Isle of Dogs. Part of the work of the group is to train local people in oral history interviewing , sound recording and archival research methods. The first training sessions have been organised and provides plenty of opportunities for people interested in local history to learn some research skills. For the group’s first project 80s Island Protests, The Isle of Dogs Living Archive will be providing free training in archival research for local people. The oral history interviews the group will conduct are vital, but so is unearthing all sorts of other material about the protests in the 80s. 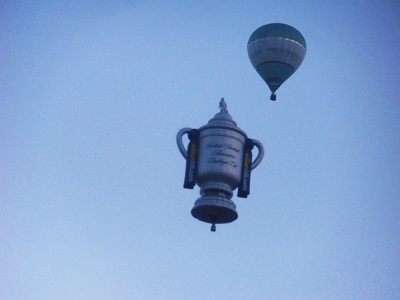 So a training session is going to be held 10.30-12.30 on Friday June 24th. It will be run by Heritage Officer Perdita Jones and will consist of an introduction to Tower Hamlets Local History and Archives (who they are, what they do, what are their collections etc. ), a demonstration of their online catalogue and an explanation of how to use the hard-copy subject guides, followed by a chance to look at a selection of library and archive material of our choice. 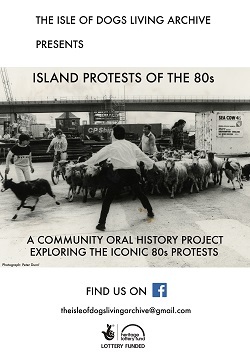 For the groups first project Island Protests of the 80s, The Isle of Dogs Living Archive will be providing free oral history training for local people to find out more about this fascinating period of Island history. The training will cover what oral history is and why we do it; how to conduct the interview as effectively as possible; an introduction to using the appropriate digital recording equipment; an opportunity to interview each other, with feedback and analysis; transcription, summarising, archiving and legal and ethical issues. Regular readers will know that the Island’s history is fascinating and the 1980s on the Island is an important period in the Island’s recent history, it was a time of considerable uncertainty, the closing down of the docks threatened the livelihood of thousands of people. 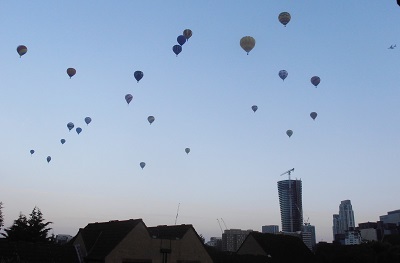 It was also the period before widespread development of Canary Wharf and the Island. 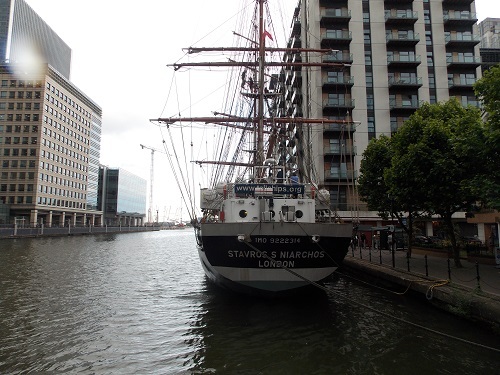 After recent Tall Ship visitors from the United States and Mexico, it is a pleasant surprise to see the arrival of the British Tall Ship Stavros S Niarchos into the West India Dock today. 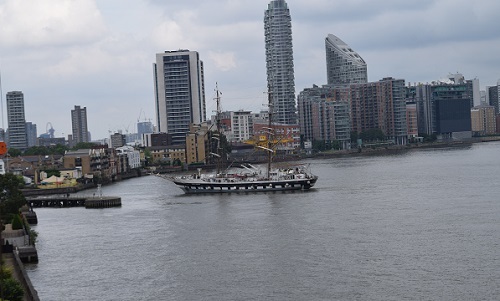 The Stavros S Niarchos was last in the dock in September last year and is a regular visitor to the Thames and a familiar sight in numerous tall ship events. The ship has a length of 197ft , masts of 148ft and beam of 32ft, she usually operates a crew of 69 which include regular crew and volunteers. 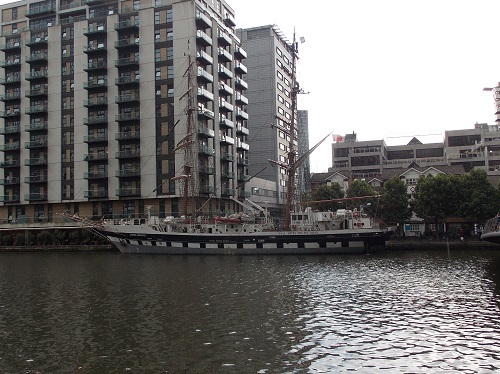 When she visited last year, the Stavros S Niarchos was put up for sale, it does appear that is still the case, so if you have dreamed of owning your own tall ship here is your opportunity. 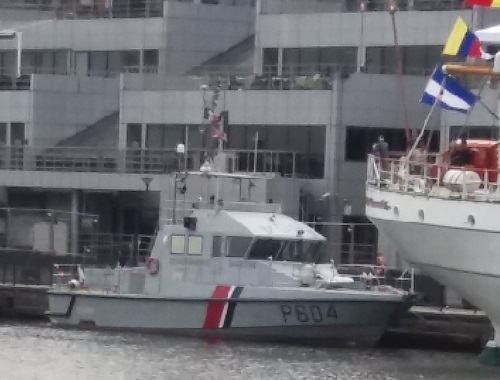 Another unexpected visitor is French Navy weapons-range safety patrol boat FS Aramis who like last week’s French visitor, the FS Scarpe is part of the Maritime Gendarmerie. The Maritime Gendarmerie are part of the French Navy and the ships carry out a series of duties including chasing criminal activity, protection of the naval shore establishments and Search and rescue. The FS Aramis was launched in 1980 and often carries a crew of around 12 including divers. 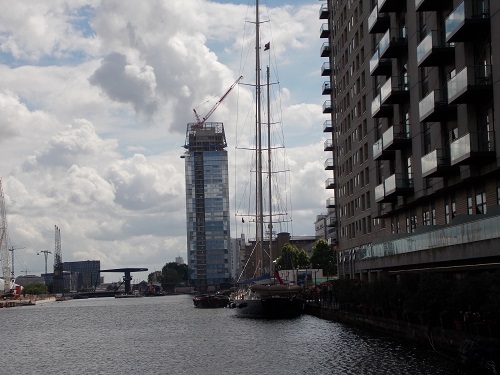 Once again, regular contributor Eric Pemberton managed to take a couple of photos of the tall ship entering the dock. 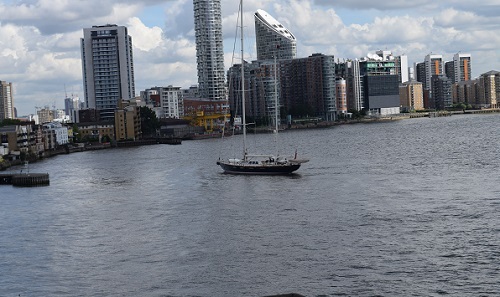 After last week when we had a combination of tall ships and super yachts in West India Dock, today we welcome the arrival of the Anakena which is sailing luxury yacht. The Anakena is a 40 metre 132 (foot) aluminium sailing yacht which was made by Royal Huisman in the Netherlands and was designed by Ted Hood and Ted Fontaine. 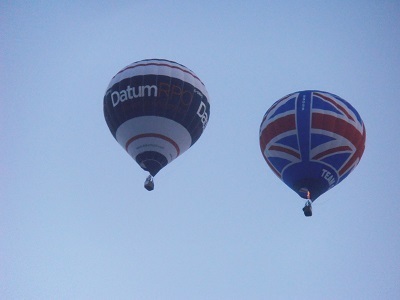 Launched in 1996 the modern interior design was undertaken by John Munford. The yacht won ‘Best Sailing Yacht Over 36 Metres’ award when she was launched and is considered one of the finest of its type. The yacht was built for extended periods of worldwide cruising at sea and it has sailed to Hong Kong, Hawaii, the Marshall Islands ,Guam, China, Japan, the Philippines, Vietnam, Singapore, Bali, Australia and many other destinations. 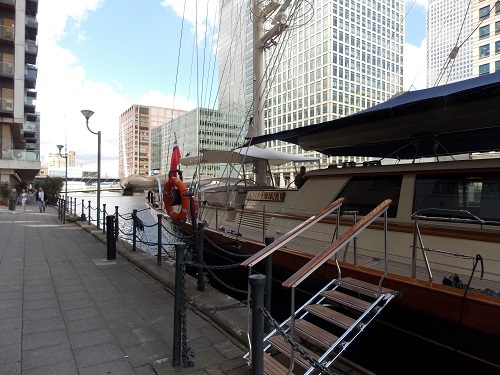 The luxury sailing yacht is used extensively by its owner and is able to accommodate a total of 6 guests and 5 professional crew. 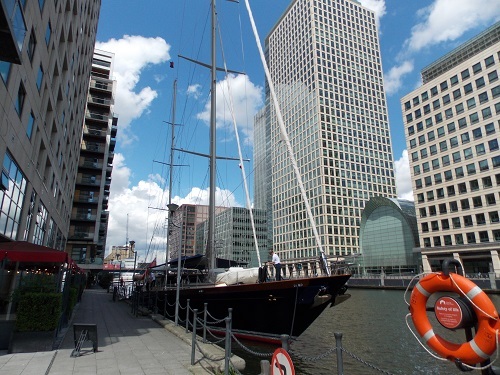 It is not known how long the yacht will be berthed in West India Dock or its future plans. 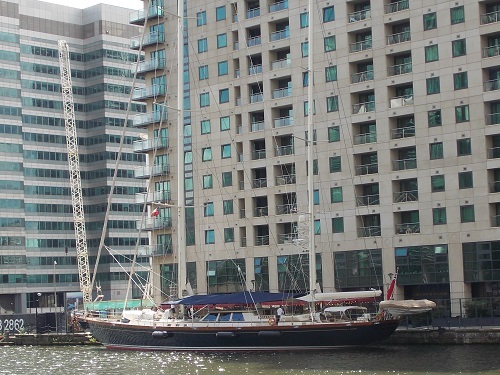 Regular contributor Eric Pemberton managed to get a picture of the Anakena entering the dock. 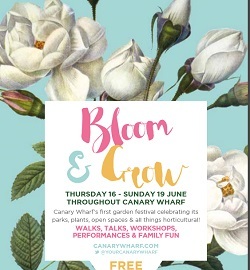 After all the excitement in West India Dock last week, we can look forward to more sedate land based enjoyment with the arrival of the Bloom and Grow Garden Festival at Canary Wharf from 16th to 19th June 2016. 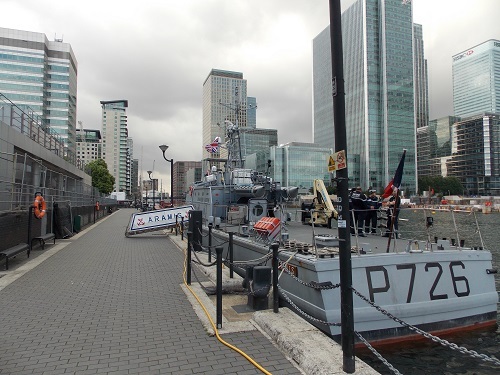 The four-day horticultural festival will feature over fifty events based around the twenty acres of outdoor space in Canary Wharf. If you are interested in horticulture there are plenty of talk, walks, workshops and number of children activities that will make the event attractive for families. 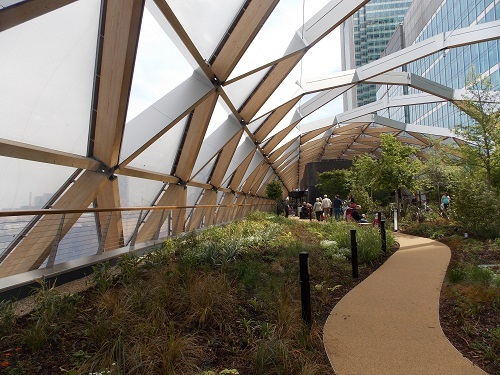 The event will be part of the London wide annual Open Garden Squares Weekend and many of the activities will be centred around the spectacular Crossrail Place Roof Garden. 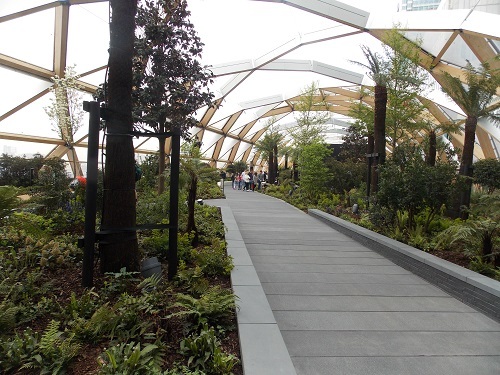 Although many of the events in Crossrail Place Roof Garden and Canary Wharf are free, if you want to visit other gardens and events featured in the Open Garden Squares Weekend you will need to buy a ticket. Events are FREE to attend unless otherwise stated. 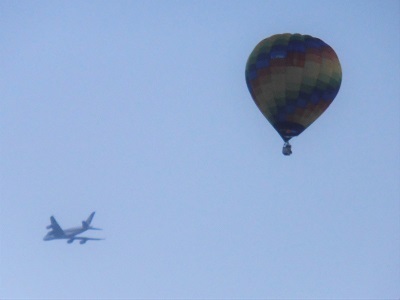 The Festival recommend you arrive early to some events with limited places to avoid disappointment. 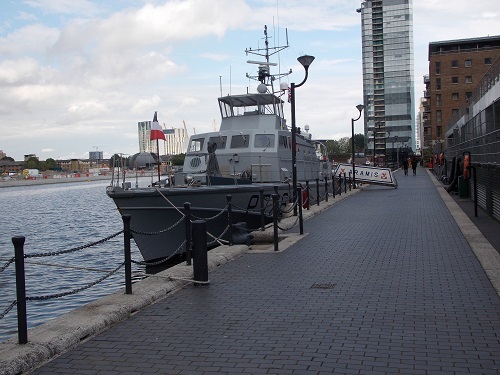 With two tall ships and two super yachts in West India Dock, the arrival of FS Scarpe of the French Maritime Gendarmerie has been somewhat overlooked. Part of the French Navy, the ships carry out a series of duties including chasing criminal activity, protection of the naval shore establishments and Search and rescue. 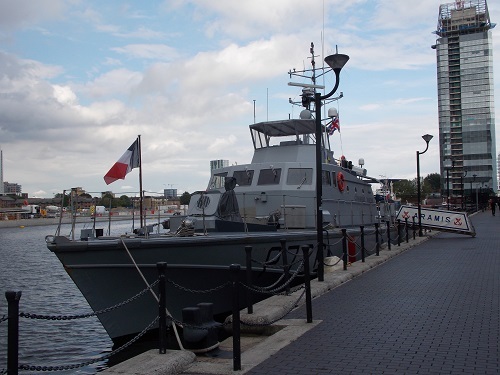 The FS Scarpe ( P604 ) is from the Vedette class which are based in various harbours of France, and are mainly used for coast guard duties including monitoring of pollution, sea police, and interception of illegal immigrants and drug traffickers. 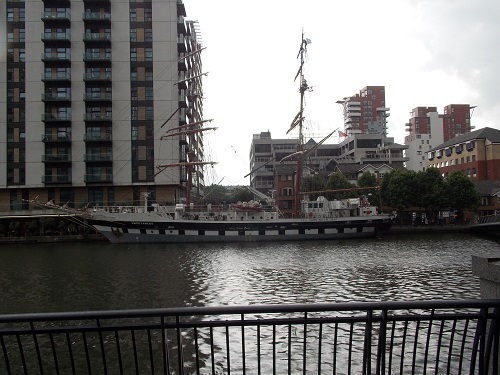 The ship is 20 metres long and carries a crew of eight. 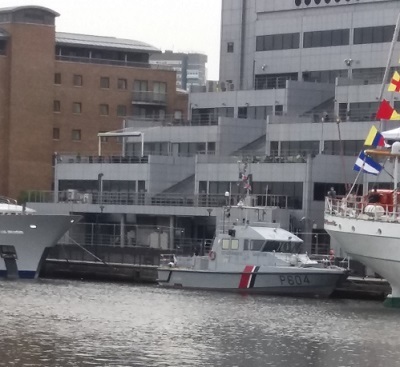 The arrival of the FS Scarpe adds to the interesting mix of ships in the dock at the moment and both the tall ships will be open to the public over the weekend.